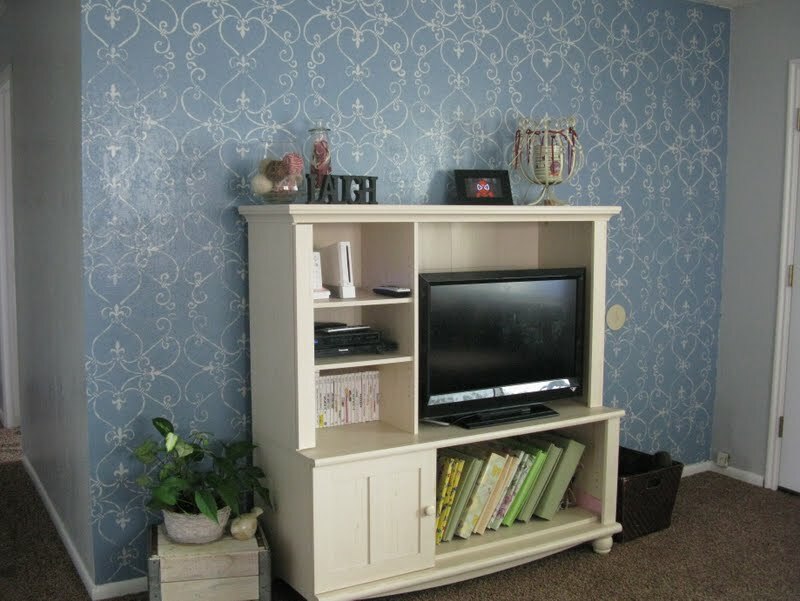 Add beautiful DIY home decor with a painted stencil wall. Paint in any color to match your home’s personal style and decore. 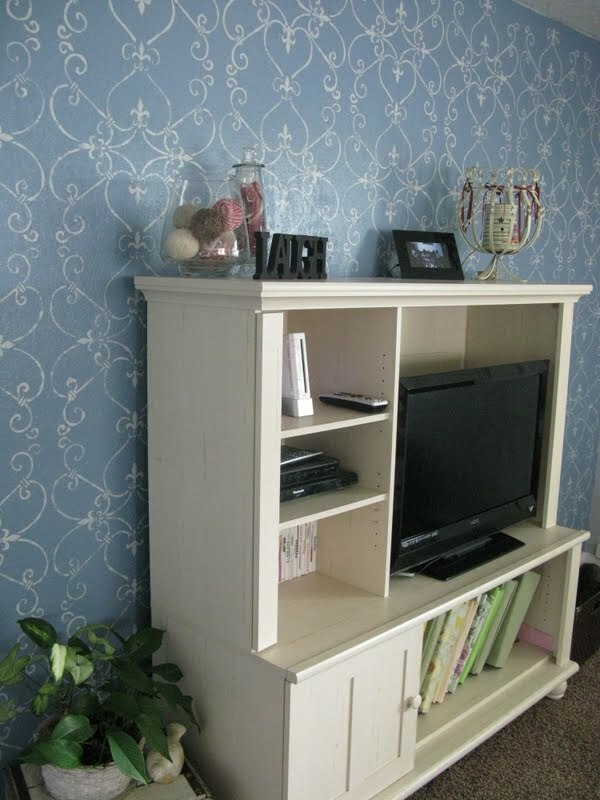 Have you noticed all of the beautiful stencil painted walls showing up everywhere? They are everywhere! Every time I saw one I would say to myself “I’ve got to do that!”. 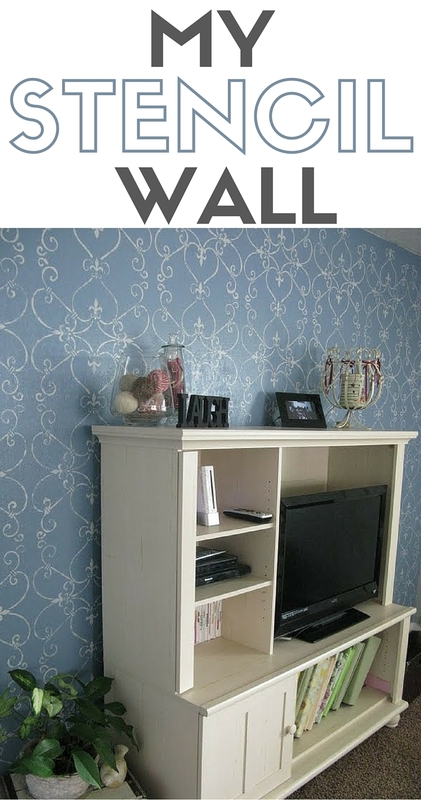 I have been drooling over all of the designs and I even knew what perfect wall to put it on. The wall behind my tv is a dark green and while I loved it, it was time for an update. 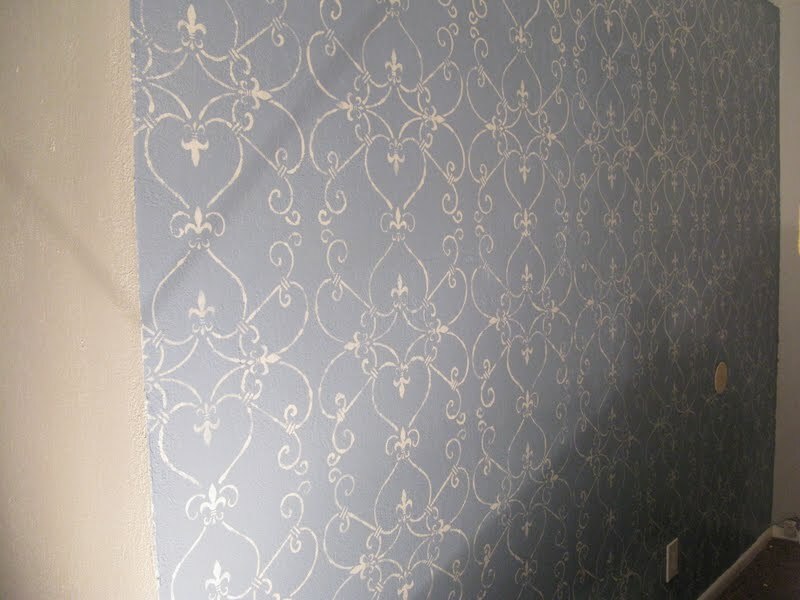 I started by painting all of the other walls a light grey and then the soon to be stencil wall blue. 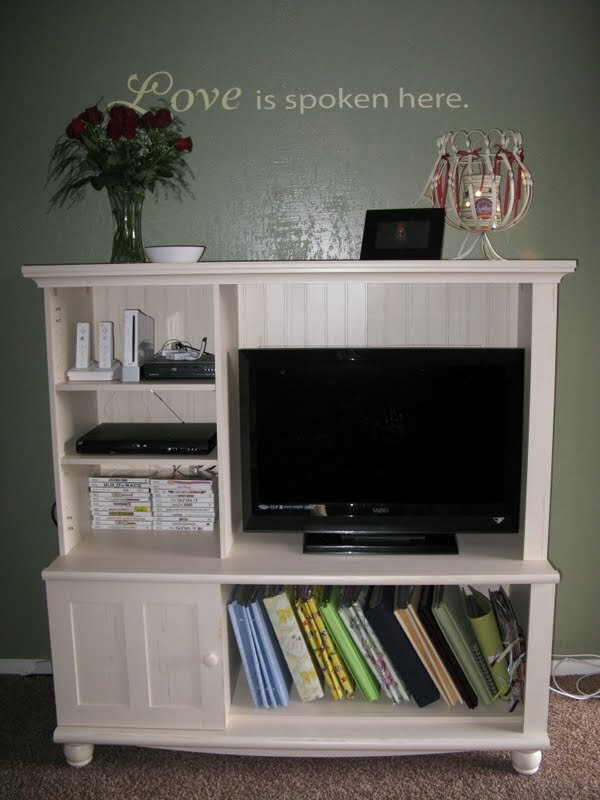 I should have taken a picture before I started stenciling, but I was too excited to get started. Here is a picture of me working on it. The stencil is about 18 x 18 inches and I felt like I moved that thing a bajillion times. I used a sponge to apply the paint. It looked really pretty but if I got too much paint on the sponge it would seep behind the stencil so I had to be very careful. I would use the stencil 4-5 times and then take it to the cink to clean it completely so I could start with a clean stencil. This isn’t a very big wall, it’s about 10 by 8 feet and it took me ALL DAY. About half way through I was getting tired and flustered and at one point I called my husband in tears and said “This is stupid! Why am I doing this to myself!” I was ready to be done and paint over all of my hard work. But I really did like how it was turning out, it was just a bit harder than I expected it to be. After a break to gather my strength and patience, I persevered and finished the wall! I really am so glad that I finished because I love how it looks. I love the look of my new living room and since the dark green is gone, it looks so much bigger. I think part of reason I love this wall is because I know how much sweat and real tears went into it. But I didn’t let it take me down. I don’t know if I’ll be stenciling another wall anytime soon, so for now I will just admire this one. 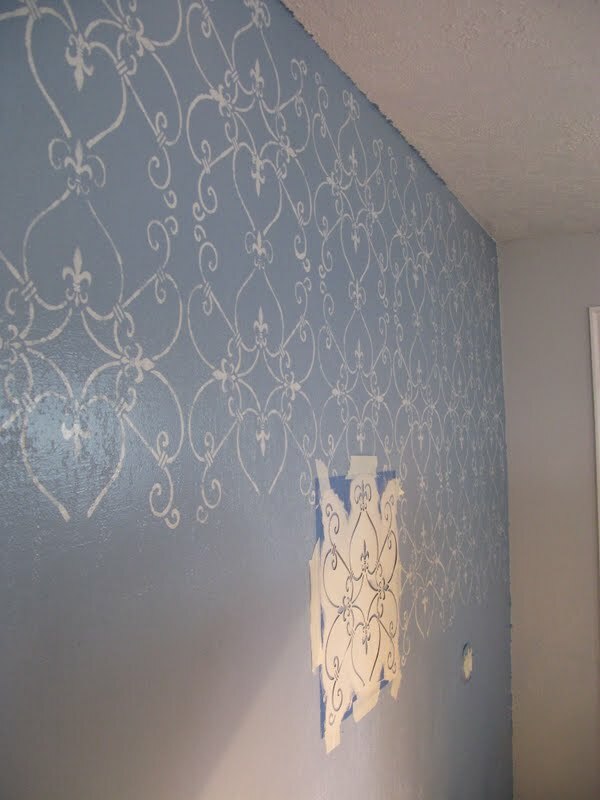 Have you ever painted a stencil wall? Did you love it, hate it or do you have any tips? I would love for you to share and leave a comment below. How pretty! Glad you stuck it out! Oh my gosh! I love, love, love it! Changes the whole look of the room! Thanks so much for sharing with the Pink Hippo Party.. can’t wait to see what you share next! Wow! It looks so great! You did such a fabulous job:) Love the stencil!! Thanks for stopping by my place. Your wall looks AMAZING!! Lovin’ the color selection. Great job!! that looks great! i have a stencil, but i haven’t got the nerve to do anything with it yet. you’re so brave, i’m amazed at your snazzy new wall! This turned out incredible! I am wanting to do this on my living room wall, but I’m worried it won’t look good…but after seeing this I am ready to go for it! It looks fantastic!!! Stopping by from Skip to My Lou! Great job! Oh my goodness this is beautiful! You have WAY more patience than me. Thanks for sharing at Creative Thursday. Wow! That turned out beautiful! I’m hosting a linky party “One Creative Weekend” at OneCreativeMommy.com. I’d love for you to visit and link up this idea and/or anything else you’d like to share. Very pretty! I Love that design. You wall is GORGEOUS!!!!! It looks so elegant and refined! It’s always worth more I think when your patience is tried with a project, you’re able to sit back and go ‘no you did not win, but yes you look amazing’ I remember my brother having a similar sort of patience test when he put up his nursery wall sticker for his little boy, but it was well worth it in the end and now I have a very happy nephew!